Happy Thanksgiving, I guess. Not being much of a holiday person, I am not anticipating the celebratory joys of eating turkey with as many relatives as my brother and his wife can cram into their home. I like cycling, not football, so I'm not going to be sitting their rah rah, cheering on my favorite team. I could care less, and this has always been the case. 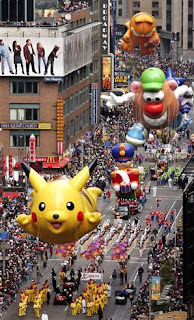 In fact, what I remember with most fondness about the holidays was the parades on TV. Boy, did I love to watch those parades: Macy's with its giant balloons and the Tournament of Roses. Of course back when I was a child things were different, American Capitalism hadn't yet reared its ugly head to devour the wonder of watching a parade. Over the years this has changed and as a result today you don't sit back and watch a parade, you watch commercials, lots and lots of commercials. You see at some point in the past, I don't know exactly when, some American Capitalist realized that most people were watching the Macy's Thanksgiving Day Parade for the balloons, not the marching bands, or the drum majorettes, or the clowns, or, in fact, all of the things which actually made it a parade. Since people are only tuning in for the balloons, this means you can sell much more advertising time to sponsors. Who cares if you miss a marching band if you can plant the seed of buying a new appliance, or car in some viewers mind. This is the directions towards which America's values have turned: making a buck. The Tournament of Roses Parade is even worse then Macy's. I haven't watched that one in at least 25 years. Back when I was a kid you got to see horseback riders, and Native Americans, and lots of marching bands from all over the country. They applied and if they were accepted, those bands did everything they could to raise money to fly out to Pasadena to be in the parade. They may still do the same thing, which is sad when you realize no one in their home town will every see them perform because some moron decided it was more important to show an ad for a Chevy truck. And it case you're wondering, it wasn't just Macy's which murdered the parade, it's anybody and everybody whose only priority is pounding away the buckos in the bank.